Wow — what a picture for these snow-weary eyes….! (And 5-8 inches more coming tonight. I know you’re accustomed to this, but we aren’t.) I’m ready for the BEACH! Yes—I know you guys are ALL ready for spring to come and stay. It has been very unusual everywhere. Mason City is set fro another 6-8 tonight as well. Glad I am in Bama! What a precious scene. You capture the sweetness of childhood. A carefree life. I would love to be that boy on the beach. It was even through a really dirty seaside cafe window but it captured his exuberance so perfectly. Took this in December at Mexico Beach (I think) in Florida. I loved watching him run around. I THINK THE SEA GULL WILL CATCH HIM. It didn’t the whole time I watched him! 🙂 Thanks for stopping by, Carl! Hey Carl, that looks like your grandson at Miami beach.. Oh, is that a seagull? I thought it was a gar chasing the lad, I’d run like the dickens too. They have nasty teeth. Nice picture Beth Ann. I love Wordless Wednesdays. Glad you like Wordless Wednesdays. Bet the beach is kind of appealing to you right now, right? I’m not a beach goer per se, but I’m sure looking forward to beach weather. My daughter and son-in-law are in Aruba on vacation right now, I am kind of envious. I am not wishing for the beach, I am just hoping for the time I can look out and see grass. It will come eventually. Maybe when we are there at Easter??? That would be wonderful, wouldn’t it? Nothing like the beach, right? 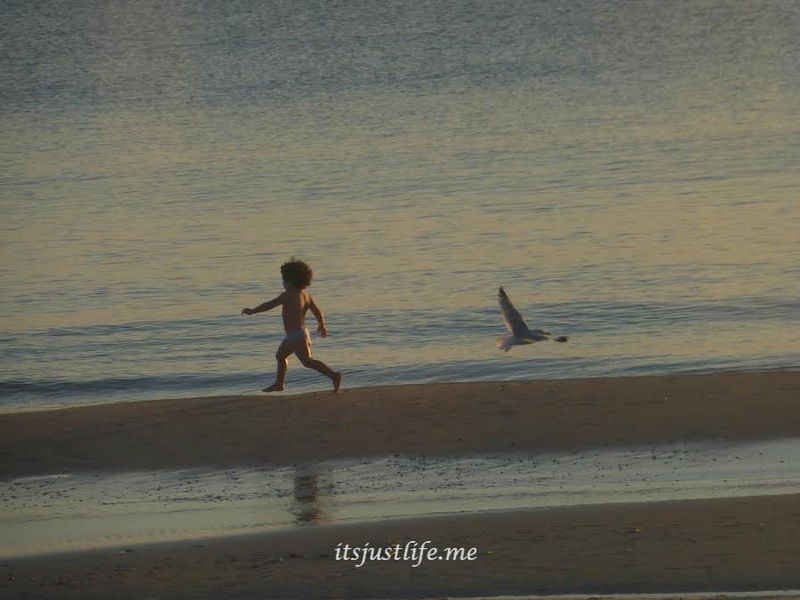 Usually you would see the boy chasing the bird rather than them both going in different directions. Yep! That was what I thought when I snapped the picture.